My friend Kay Handlang gave this quilt kit to me that was featured on the cover of the 2008 September/October issue of Quiltmaker Magazine. The designers of the quilt are Cori Derksen and Myra Harder of Blue Meadow Designs. When my young friend Stephanie announced that she was going to have a boy I thought this would be the perfect quilt for him. Little did I know that the colors in the kit were the exact colors of Brady's room. 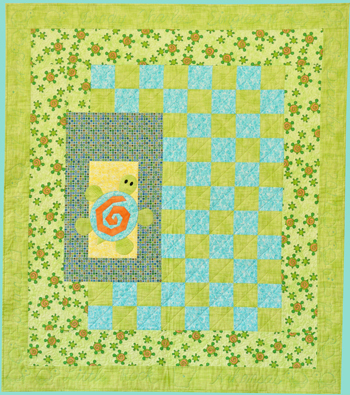 This kit came with all the fabrics including the turtle fabric which inspired the large turtle featured in the quilt. 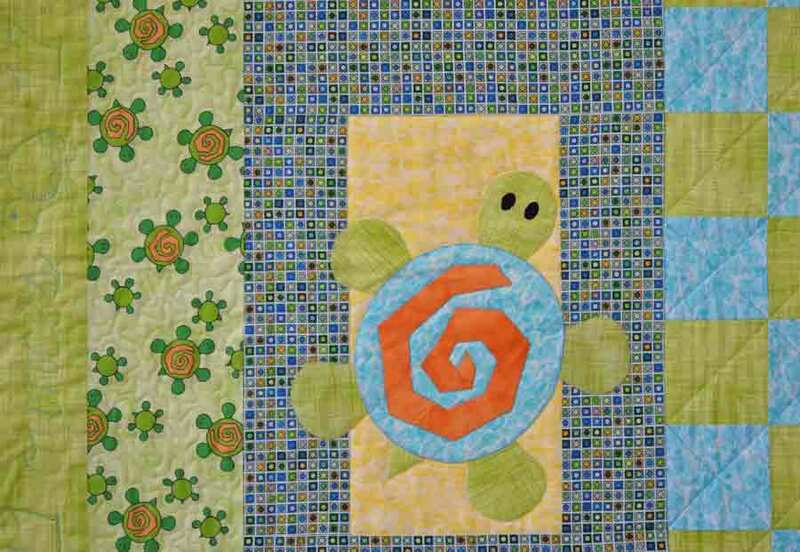 If I wanted to make another quilt using this pattern I could chose a focus fabric like the turtles to use on the inner border and then feature something besides a turtle. In the original pattern they also included a lollipop pattern to use in place of the turtle. On the outside border of this quilt I quilted in Brady's stats. I included his full name, the time and date of his birth, his weight and height, and the city and state where he was born. 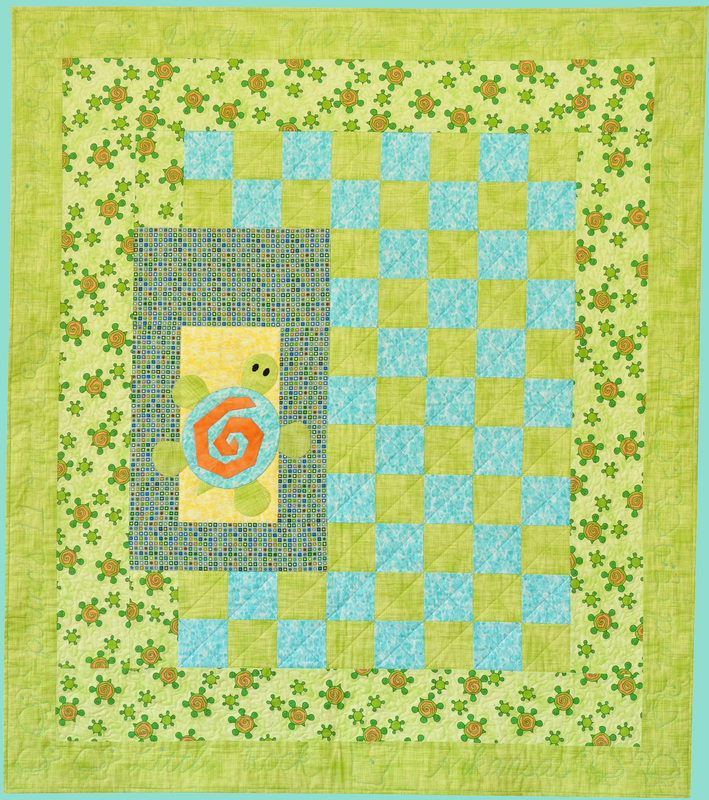 To fill in the gaps I quilted in little turtles. This is a good way to fill up the space. I searched images on Google for an appropriate clip art of a turtle. Then I printed several different sizes on a sheet of paper. After determining the best size I traced the turtle on Golden Threads tracing paper. Golden Threads tracing paper is a no-marking method to create tear away stencils. 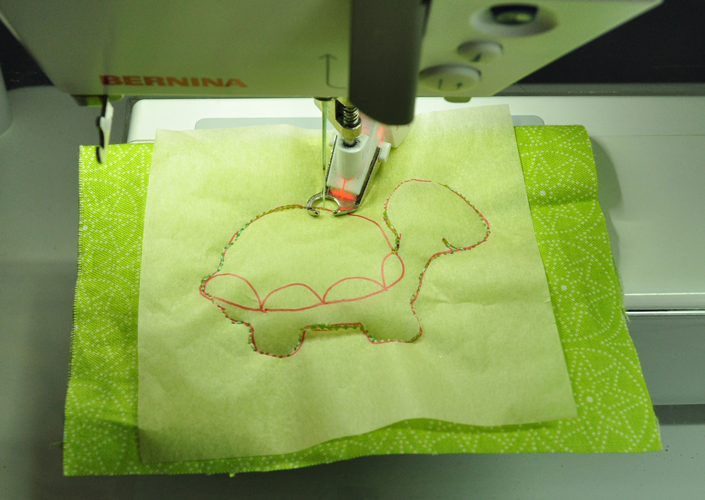 You will need one turtle tracing for each turtle you are going to sew onto your quilt. Then I pinned the turtle on the quilt and free motion quilted along the tracing. The tissue easily tears away when you are done. The quilt is 41" x 47". It is raw-edged machine appliquéd and machine quilted.